For sale is my Zoom multi track recording studio MRS-1044. In full working order with original packaging, manual and power converter. Powers up quickly and works just as well as the day I bought it sometime around 2003. Thanks for looking. Tascam Digital PortaStudio DP-01FX. Condition is Used. Dispatched with Royal Mail 2nd Class. Great item! I was mainly using this for a mobile podcast studio but also for recording bands. Much cheaper than digital equivalent and lovely warm sound for such a small little studio. Power supply included (will add some photos of it switched on shortly) Selling due to downsizing. Please check out my other items. Lots of studio gear for sale. Collection no problem. Potentially could arrange delivery/meeting halfway, please enquire to figure out cost. Any questions feel free to ask! Happy bidding! Boss BR-1180 Digital Recording Studio. This powerful digital studio gives you 8 playback tracks, a stereo Master Track and 80! Yes 80 virtual tracks for recording. Add to this killer boss effects and drum sounds and there is nothing you can’t do. Great condition, no damage anywhere. Please note this is not the cd version but the hard drive version. ZOOM MRS-802 MULTI 8 TRACK DIGITAL RECORDING STUDIO (no CD drive or power lead) has internal memory. Condition is Used. Dispatched with Royal Mail 2nd Class or buyer to collect. ZOOM MRS-802 MULTI 8 TRACK DIGITAL RECORDING STUDIO . Condition is Used. Built in Drum track sounds. Record any instrument professionally, mix and master yourself. No disc drive or power leads. Item listed elsewhere so right reserved to remove if sold independently. The drive bay doors have been removed for practicality. Alesis HD 24 Digital recorder. Condition is Used but immaculate, fully working used in a smoke free environment and really looked after (see pictures). Comes with: -2x Western Digital hard drives 160 and 200GB. -Alesis Fireport -wordclock terminator ............…..............…………… Dispatched with tracking option. Dispatched after 29th April Collection welcome from Maida Vale. ...............……………… SKB - 4U rack case available on request. 360 Systems Shortcut SC-182 Stereo Audio Editor. And they sound superb, with really excellent converters. Has balanced inputs/outputs on XLR, also AES/EBU in/outs on XLR and BNC. It records directly to internal hard drive - the drive has just been freshly formatted. Yamaha AW4416 Professional Audio Workstation Live Mixer and Recorder. Condition is New. Collection in person only. One plastic knob is missing but still usable without it, see picture. Other: MIDI In/Out. Alesis Sync In/Out (DB-9). Word Clock Input (BNC, 75). Footswitch Jack For Punch In/Out (1/4"). LRC Input For Traditional Wired Remote (1/4"). 10 Base-T Ethernet (RJ-45). Weight: 20lbs (9.07Kg) Without Flight Case. The MR-1000 includes Korg’s "AudioGate" format conversion software, so you can use a com- puter to convert audio files to different file formats. Highly regarded 'future-proof' digital recorder. The MR-1000 is an ultra-high-quality recorder that can record and play back in DVD audio format (24-bit/192 kHz), SACD (Super Audio CD) quality format (1-bit/2.8 MHz), and in the even higher-quality 1-bit/5.6 MHz format. Zoom MRS-802 8 Track Recording Studio with CD drive, 40gb hard drive and power cable included. This unit has Phantom power (which can be seen in the photos). As can be seen in the photos the screen is in excellent condition and a screen protector will be applied prior to postage. Condition is Used. However, the item has been stored properly in a dry environment. All previous recordings (excluding the factory supplied tracks) have been erased. A full printed operational manual is also included. Unfortunately this is not the original but is in a ring binder. Dispatched with Other Courier (3 to 5 days). You have access to all the non-destructive editing functions you'd expect: Copy, Cut, Erase, Insert, Paste, Repeat, and Move. Onboard mastering. A multi-band compressor/expander for stereo mastering is built in, as is sample rate conversion and bit depth dithering. Got a cd recorder on side. Is been use almost nothing. Easy to replace them. 2 of 2 HD24 recorders available. HD24 is built exclusively for the purpose of recording music instead of data, resulting in remarkable stability and performance. HD24 features ADAT Optical and ADAT Sync, enabling it to work efficiently with existing systems. Of note, I have owned the AW4416 from new. Also, the rubber below the faders has alsostarted to go sticky. If I were to keep the unit, I would most likely coverthem in film / tape. All the knobs /faders etc are intact. The Korg D1200mkII digital recorder burns the recorded audio onto an audio CD. This Korg portable digital recorder is designed mainly for guitarist/songwriter, as it features a dedicated guitar input jack. 800 1180 1600 DIGITAL RECORDING STUDIO. E asy operation for guitarists BR-1200CD new product appears in BOSS BR series digital recorder. Bass part with rhythm pattern and bass sound source can be made easily with only BR - 1200 CD, and high - quality effects are also loaded so you can connect the guitar and bass microphone directly to the CD It can do smoothly with one unit until production. Appearance of the item. It is totally in good condition. I will look it for you. ZOOM MRS-1266. AC Adapter (input 100-240V 50-60Hz). The operation operates normally. Middle East. CD-R/RW DRIVE. PERFECT WORKING CONDITION. This unit is running version 1.0. It has a 15GB Hard Drive installed. This unit powers off a 12V power adaptor. A great condition 744T, with the original box, power cable, manual, CL1 keyboard interface (£250 alone') and shortcuts card. The BOSS BR - 1600 CD is a top - level model of the BOSS BR series, which has a simple operationality and built - in effects and is popular as a guitarist recorder. Model BR-1600CD. perfect working. 100-240V Adapter. I will look it for you. I will provide courteous and responsive service. 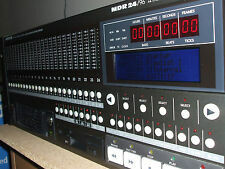 Mackie M DR 24/96 Hard Disc Recorder. Upgraded to HDR Specifications. With Revised HDR Firmware text. 3 x Mackie DIO-8 Optical Cards Installed. With HDR Firmware Upgrade Eprom. With BIOS Upgrade Eeprom installed. The Restringsr is in 100% perfect working condition. Type Digital Recorder. Optical drive is DVD-ROM/R/RW. ZOOM MRS-802. ( zoom original Adapter.). manual is downloadable from a ZOOM web site. AC Adapter input 100-240V 50-60Hz. Middle East. We cannot take the responsibility for such cases. (Kenwood MGR-A7. Digital Audio Recorder. Tripod Cover Case CC-MGRA7SE. Easy to use as Player and Recorder. 6mm, lenght 4.5mm). for decreasing noise during Recording. Where the VM-3100 really shines is in the highly flexible signal routing capabilities. Digital outputs include A and B busses, bringing the total number of busses to 12. Channel inputs include two balanced Mic/Line inputs with phantom-powered XLR or standard TRS jacks, six unbalanced Mic/Line inputs (including a Hi-Z input for direct guitar connection), and four Line inputs. ZOOM MRS-1044. (It is not a ZOOM original adapter). AC Adapter input 100-240V 50-60Hz. The operation operates normally. PERFECT WORKING CONDITION. HD24 faults If you have got a PC with ATA bay, I can share a PC software by what you can easily download records from harddisk without special firewire tool, or using network connection to HD24. -1 piece modified specialy for ATA notebook harddisks (44 pol connector). The VS-880 Digital Studio Workstation is the first affordable integrated digital restringsr, digital mixer, digital editor and effects processor in the world. An expansion slot can be fitted with the VS8F-1 Effects Expansion Board, providing two powerful, independent onboard multi-effects units. 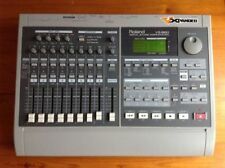 Tascam PortaStudio DP-01FX Digital Multi-track Recorder. This came from a closed music studio and I was assured it works ok. I was able to power it on and all buttons functions ok but no further test was done. The physical condition is Ok with very minor marks. No power adapter or any other accessories. PLEASE BUY THIS AS NOT FULLY TESTED, NO RETURN OR REFUND ON THIS. Condition is Used. The item is in excellent condition and fully working order. HDD 40GB CD-R/RW. Digital Recording Studio. Boss BR-1200 CD. OUTPUT 12V 5A. INPUT AC100-240V 50/60Hz 2.0A. Good working condition. A main part and an AC adaptor. We cannot take the responsibility for such cases. The Restringsr is in excellent, 100% perfect working condition. Type Digital Recorder. ZOOM MRS-1044. (It is not a ZOOM original adapter). w/UIB-01(USB ). AC Adapter input 100-240V 50-60Hz. The operation operates normally. Middle East. PERFECT WORKING CONDITION.